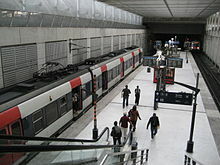 The Réseau Express Régional (English: Regional Express Network), commonly abbreviated RER (French pronunciation: ​[ɛʁ.ə.ɛʁ]), is a hybrid suburban commuter/rapid transit system serving Paris, France and its suburbs. The RER combines the operations and roles of a local city-centre underground rail system and suburbs-to-city-center commuter rail. Inside the city center, the RER functions much like the Métro, but is faster as it has fewer stops. This has made it a model for proposals to improve transit within other cities. The network consists of five lines: A, B, C, D and E. The network has 257 stations and has several connections with the Paris Métro within the city of Paris. The lines are identified by letters to avoid confusion with the Métro lines, which are identified by numbers. The RER is still expanding: Line E, which opened in 1999, is planned for westward extension in two phases by 2020–2022. The RER contains 257 stations, 33 of which are within the city of Paris, and runs over 587 km (365 mi) of track, including 76.5 km (47.5 mi) underground. Each line passes through the city almost exclusively underground and on dedicated tracks. The RER is operated partly by RATP, the transport authority that operates most public transportation in Paris, and partly by SNCF, the national rail operator. In spite of this, the system uses a single fare structure and no transfer is needed between sections run by the two operators (when there are no strikes). Total traffic on the central sections of lines A and B, operated by RATP, was 452 million people in 2006; in the same year, total traffic on all lines operated by SNCF (both RER and Transilien trains) was 657 million. RATP manages 65 RER stations, including all stations on Line A east of Nanterre-Préfecture and those on the branch to Saint-Germain-en-Laye. It also operates stations on Line B south of Gare du Nord. Other stations on the two lines and those on lines C, D and E are operated by SNCF. 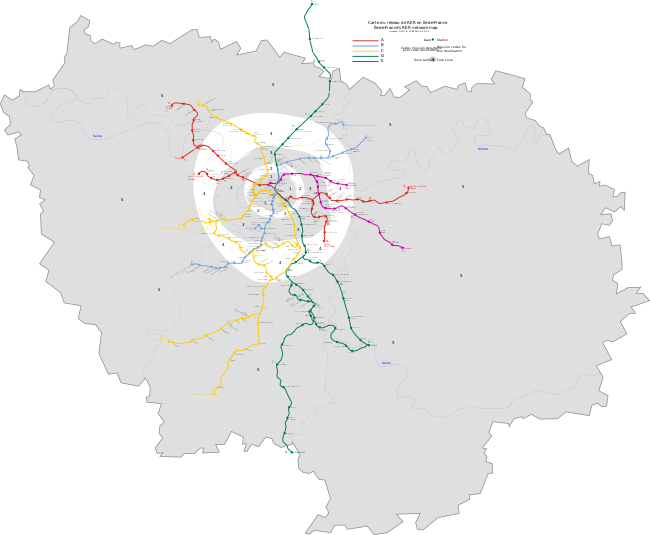 Of the RER stations operated by RATP, 9 have interchanges with Métro lines, and 9 allow transfer to SNCF's Transilien service. The origins of the RER can be traced back to the 1936 Ruhlmann-Langewin plan of the Compagnie du chemin de fer métropolitain de Paris (Metropolitan Railway Company of Paris) for a "métropolitain express" (express metro). The company's post-war successor, RATP, revived the scheme in the 1950s, and in 1960 an interministerial committee decided to go ahead with the construction of an east-west line. Subsequently, the central part of the RER was completed between 1962 and 1977 in a large-scale civil engineering project whose chief supervisor was Siavash Teimouri. As its instigator, RATP was granted authority to run the new link. The embryonic (and as yet unnamed) RER was not properly conceived until the 1965 Schéma directeur d'aménagement et d'urbanisme (roughly: "master plan for urban development"), which envisioned an H-shaped network with two north-south routes. Between 1969 and 1970 RATP purchased the Vincennes and Saint-Germain lines from SNCF, as the basis for the east-west link. Only a single north-south route crossing the Left Bank has so far come to fruition, although the Métro's line 13 has been extended to perform a similar function. In the first phase of construction, the Vincennes and Saint-Germain lines became the ends of the east-west Line A, the central section of which was opened station by station between 1969 and 1977. On its completion, Line A was joined by the initial southern section of the north-south Line B. During this first phase, six new stations were built, three of which are entirely underground. Construction was inaugurated by Robert Buron, then Minister for Public Works, at the Pont de Neuilly on 6 July 1961, four years before the publication of the official network blueprint. The rapid expansion of the La Défense business district in the west made the western section of the first line a priority. Nation, the first new station, was opened on 12 December 1969 and temporarily became the new western terminus of the Vincennes line. The section from Étoile (not yet renamed after Charles de Gaulle) to La Défense was opened a few weeks later. It was subsequently extended eastward to the newly built Auber station on 23 November 1971, and westward to Saint-Germain-en-Laye on 1 October 1972. The latter extension was achieved by a connection to the existing Saint-Germain-en-Laye line, the oldest railway line into Paris, at Nanterre. The RER network came into being on 9 December 1977 with the joining of the eastern Nation-Boissy segment and the western Auber-Saint-Germain-en-Laye segment at Châtelet – Les Halles. The southern Ligne de Sceaux was simultaneously extended from Luxembourg to meet Line A at Châtelet – Les Halles, becoming the new Line B. The system of line letters was introduced to the public on this occasion, though it had been used internally by RATP and SNCF for some time. Line C (along the Left Bank of the Seine) was added in 1979, involving the construction of a link between Invalides and Musée d'Orsay. Line B was extended to Gare du Nord in 1981 with a new deep tunnel from Châtelet – Les Halles. It was subsequently extended further northward. Line D (north to south-east via Châtelet – Les Halles) was completed in 1995 with the construction of a deep tunnel between Châtelet – Les Halles and Gare de Lyon. No new building work was necessary at Châtelet – Les Halles, as additional platforms for Line D had been built at the time of the station's construction 20 years earlier. Line E was added in 1999, connecting the north-east with Gare Saint-Lazare by means of a new deep tunnel from Gare de l'Est. The RER's first phase of construction during the 1960s and 1970s was marked by scale and expense. In 1973 alone, FRF 2 billion were committed to the project in the budget. This equates to roughly €1.37 billion in 2005 terms, and closer to double that as a proportion of the region's (then much smaller) economic output. :77 This and subsequent spending was partly sustained by the versement transport, a local tax levied on businesses. The tax was introduced in July 1971 and remains in effect. Vector map of the network showing the outline of Île-de-France. The predominance of suburban SNCF track on the RER network explains why RER trains use overhead line power and run on the left, like SNCF trains (except in Alsace-Moselle), contrary to the Métro where trains use third rail power and run on the right. RER trains run by the two different operators share the same track infrastructure, a practice called interconnection. On the RER, interconnection required the development of specific trains (MI 79 series for Materiel d'Interconnexion 1979, and MI 2N series for Materiel d'Interconnexion à 2 niveaux (double-deck interconnection stock)) capable of operating under both 1.5 kV direct current on the RATP network and 25 kV / 50 Hz alternating current on the SNCF network. The MS 61 series (Matériel Suburbain 1961) can be used only on the 1.5 kV DC network. The first RER rolling stock in fact predated the formation of the RER by 40 years, with the Z 23000 stock used on the ligne de Sceaux (which was subsequently integrated into RER B) from 1937 until February 27, 1987. In 1965 the Z 5300 train was introduced, followed by the MS 61 in 1967 (refurbished 1985-1987 and 2006-2009), MS 79 in 1980, MS 84 and Z 8800 in 1985, Z 20500 in 1998, MI 2N in 1996, Z 20900 in 2001 and MI 09 on December 5, 2011. Nation (1969): deep construction at the Place de la Nation. Charles de Gaulle–Étoile (1970): deep construction at the Arc de Triomphe. La Défense (1970): near-surface construction beneath the site of the yet-to-be-built Grande Arche de la Défense, just outside the Paris city boundary. Auber (1971): deep construction near Gare Saint-Lazare. Châtelet–Les Halles (1977): near-surface construction on the site of the former marketplace, claimed in 2017 to be the largest underground station in Europe. Gare de Lyon (1977): near-surface construction beneath and alongside the main-line SNCF station. Line B station at Aéroport Charles de Gaulle 2. Some controversy followed the construction of the Line A. Using the model of the existing Métro, and unlike any other underground network in the world, engineers elected to build the three new deep stations (Étoile, Auber and Nation) as single monolithic halls with lateral platforms and no supporting pillars. A hybrid solution of adjacent halls was rejected on the grounds that it "completely sacrificed the architectural aspect" of the oeuvre. :31[Notes 1] The scale in question was vast: the new stations cathédrales were up to three times longer, wider and taller than Métro stations, and hence 20 or 30 times more voluminous. Most importantly, unlike the Métro they were to be constructed deep underground. The decision turned out to be expensive: around 8 billion francs for the three stations, equivalent to €1.2 billion in 2005 terms, with the two-level Auber the costliest of the three. :34 The comparison was obvious and unfavourable with London's Victoria line, a deep line of 22 km (14 mi) constructed during the same period using a two-tunnel approach at vastly lower cost. However, the three stations represent undeniable engineering feats and are noticeably less claustrophobic than traditional underground stations. Gare du Nord (1982): near-surface construction on two levels. St-Michel - Notre-Dame (1988): deep construction on an existing stretch of the Line B between Luxembourg and Châtelet - Les Halles with two tunnels, common in other underground systems but unique in Paris. The station is situated on and built at the same time as the Luxembourg Châtelet tunnel. Two stations were added to the network as part of Line E in the 1990s. They are notable for their lavishly spacious deep construction, a technique not used since Auber. Although similar to the three 1960s "cathedral stations" of Line A, their passenger traffic has so far proved vastly lower. Magenta (1999): deep construction serving both Gare du Nord and Gare de l'Est. Haussmann - Saint-Lazare (1999): deep construction serving Gare Saint-Lazare and Auber. Journey times, particularly on east-west and north-south routes, have been cut by the RER (and thanks to the cross-platform connection at Châtelet - Les Halles, even certain "diagonal" trips have reduced journey times). Lines A and B reached saturation relatively quickly, exceeding by far all traffic expectations: up to 55,000 passengers per hour in each direction on Line A (1992), the highest such figure outside of East Asia. :61 Despite a frequency of more than one train every two minutes, made possible by the installation of digital signalling in 1989, and the gradual introduction of double-decker trains from 1998 to 2017, the central stations of Line A are critically crowded at peak times. Used for leisure journeys, the RER has had a major social impact. By bringing far-flung suburbs within easy reach of central Paris, the network has aided the reintegration of the traditionally insular capital with its periphery. The evidence of this social impact can be seen at Châtelet - Les Halles, whose neighbourhood and Forum des Halles leisure and shopping facilities are popular among banlieusards (suburbanites), in particular from eastern suburbs. westward from Haussmann - St Lazare to Mantes-la-Jolie. 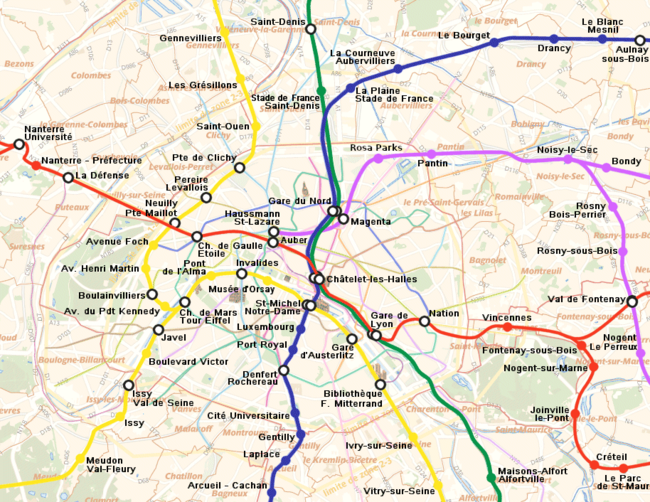 Plans for this extension include an eight kilometer bored tunnel from the current western terminus at Haussmann - St Lazare, with new stations at Porte Maillot, La Défense, and Nanterre - La Folie, and a connection to the SNCF Normandy line in or near Nanterre, the transfer of the current Line A Poissy service to Line E, and its further extension down the Seine valley to Mantes. Until the western section is in service, neither of the eastern extensions can be put into service, as the Haussmann - St Lazare station is at maximum capacity because all trains are currently forced to turn around at this station. Once the western extension is in service, Haussmann - St Lazare will become a through station and the eastern extensions will be possible. One of the primary reasons for the completion of Line E through Paris is to relieve overcrowding on Line A, especially during peak commute periods. Plans for the westward extension are in an advanced stage and construction is to begin in 2013, with an inauguration of the new line in 2020. A new Line E station initially proposed at Rue de l'Évangile (eventually officially called Rosa Parks) on the approach to Gare de l'Est, opened in December, 2015. The RER has received criticism for its high level of particle pollution during busy periods, essentially due to train braking. Pollution by PM10 particles regularly reaches 400 µg/m³ at Auber, substantially more than at neighboring metro stations and eight times the EU Commission's daily average limit of 50 µg/m³. ^ "Regional Rail for New York City – Part I". 16 July 2009. ^ "Line A: a priority". RATP. Archived from the original on 28 October 2011. Retrieved 11 November 2011. ^ "New management system for line B". RATP. Archived from the original on 3 April 2012. Retrieved 11 November 2011. ^ a b c d e Gerondeau, Christian (2003). La Saga du RER et le maillon manquant. Presse de l'École nationale des ponts et chaussées. ISBN 2-85978-368-7. ^ "Versement transport" (PDF). ACGEI. Archived from the original (PDF) on 25 April 2012. Retrieved 11 November 2011. ^ "Ouverture de la Porte Marguerite de Navarre, nouvel accès direct à la gare de Châtelet-Les Halles". RATP. ^ Large, Pierre-François (2013). Des Halles au Forum: Métamorphose au coeur de Paris. Harmattan. p. 102. ^ "A new RER station in Paris : Rosa Parks ! – Lodgis Blog". blog.lodgis.com. Gaillard, Marc (1991). Du Madeleine-Bastille à Météor: Histoire des transports Parisiens. Martelle. ISBN 2-87890-013-8. Allen, Geoffrey Freeman (August 1983). "The Underground Revolution". Rail Enthusiast. EMAP National Publications. pp. 8–10. ISSN 0262-561X. OCLC 49957965. Wikimedia Commons has media related to Réseau Express Régional. See also: List of stations of the Paris Métro, Tramways in Île-de-France, and Transport in Paris.